SATB. Composed by Franz Schubert (1797-1828). Edited by Robert Shaw and Alice Parker. Choral Large Works. Classical Period. Vocal score. With vocal score, lyrics, piano reduction, introductory text and translations. 64 pages. G. Schirmer #ED2170. Published by G. Schirmer (HL.50324620). ISBN 0793554829. 6.7x10.5 inches. Arr. Alice Parker/Robert Shaw. register whilst maintaining tone and avoiding forcing, Three soloists are required -a Soprano ( with a fair amount to sing), a Bass with a very moderate amount of work and a Tenor with only a brief entry, The Kyrie is tranquil and quite easy to manage. The Gloria is more demanding with numerous top G's and A's for the sopranos. The Credo needs careful attention to dynamics, especially the 'pp' pasages.The Sanctus offers delightful contrasts between the Adagio moderato and the Allegro sections. Most of the Benedictus is taken by the three soloists, with the Chorus repeating the Allegro section of the Sanctus. The soprano and bass soloists, along with the chorus, bring the work to a tranquil conclusion. 25 of 50 people found this review helpful. Thought this was a fabulous printing. Easy to read and the music itself it beautiful...thank you Mr Schubert! Used this for a community "sing through" and others in the group ha old printings which were hard to read. This one was a pleasure. 24 of 46 people found this review helpful. very awe-inspiring experience and was surprised and thrilled to find the music and score was an exact copy of the music I had scribbled in so long ago and, after many rehearsals, sung in performance with a full orchestra. 30 of 61 people found this review helpful. The Southern Highlands New South Wales, Australia. February 08, 2008 Appealing Music for Liturgical or Concert Use. edition is clear with an adequate piano reduction accompaniment. 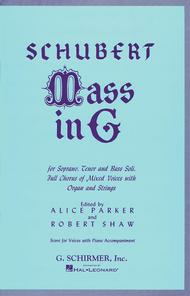 This is a wonderful printing for sight singing with a CD of the Mass. I have one College level voice class and have been singing with my church choir for a year. 26 of 58 people found this review helpful.